Mid-week clean and weekly linen change. 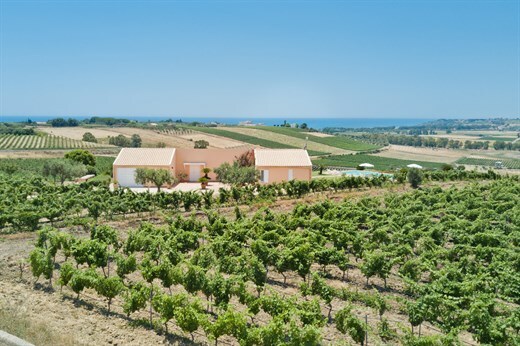 A classic sea-view summer house immersed in a vineyard. Elegantly positioned in a Chardonnay vineyard that stretches down towards the easily accessible sandy beaches of the Belice Delta Nature Reserve, Le Chicas is many people's idea of the perfect holiday house: comfortable and practical inside with a large shaded pergola and a panoramic pool outside... all you need to get on with what you've come for: taking it easy. Inside accommodation at Le Chicas is all on one floor and revolves around the central, open-plan living and dining area, which features high beamed ceilings and large sliding glass doors that not only access the large covered pergola outside, but also bring the panoramic views of the vineyards and the sea inside. Just off the dining area is the well-equipped kitchen, also with views down to the sea. At either end of the house are two bedrooms: a twin and a double-twin sharing a shower room at one end, and two doubles at the other (one with en-suite shower room and sea views, the other with en-suite bathroom with tub and garden views). Outside: accessed via large glass sliding doors in the living and dining area is a long, shady pergola that stretches the entire length of the front of the house. Furnished for dining and relaxing, this pergola boasts a 180-degree panorama that takes in the blue of the sea, the pool and the rolling vineyards that characterise the property and the area. The pool sits in a lawned area with the same superb views and has wide steps making for easy access for old and young alike. A practical, modern house close to sandy beaches. Great for families. The closest beaches are in the Belice Nature Reserve - wild and unspoilt. There are no lidos and you have to park just outside the reserve and walk for 5-10 minutes. The effort is worth it! Otherwise the seafront of nearby Porto Palo has a fantastic beach with lidos, bars and restaurants. Even better is Planeta's exclusive Beach Club at nearby Lido Fiori to which guests staying at Le Chicas have privileged access (entrance fees apply). Cycling in the Menfi area is a very pleasurable pastime, thanks to both the quiet back roads and the purpose-built cycle track along and around the old railway line between Menfi, Porto Palo and Sciacca (running very close to Le Chicas). We’d be delighted to have bikes delivered to your villa and, if anyone in your group is an inveterate pedaller, arrange for a local guide to show them the best routes. The long, often deserted sandy beaches are without a doubt one of the major attractions of the area around Menfi, and Le Chicas is within easy reach of several of these. From the wild beaches of the Belice Nature Reserve (5 mins by car) to the fully equipped lidi with sports and restaurant facilities of Porto Palo, this area is a magnet for beach loves. Guests staying at Le Chicas have privileged access to Planeta's exclusive Beach Club at nearby Lido Fiori (entrance fees apply). For those in search of culture, the superb Greek archaeological site of Selinunte is one of the finest in the Mediterranean. Menfi itself is a centre of the local wine industry, with several wineries, including two Planeta wineries that produces some of the best known wines of that famous marque. Sciacca, too, is just up the coast. This old fishing port and spa town is well worth a visit, and has some great fish restaurants. If you're looking to explore some of Sicily's historic towns and cities, Palermo, Trapani, Marsala, Mazara del Vallo and Erice are all between 45mins and hour and 1.5 hours' drive away. And when you've done all that, head inland to see some fascinating hill towns, such as Caltabellotta or Sambuca. "What did we enjoy most about our holiday in Sicily? The weather and the view and pool from Le Chicas." Le Chicas was really nice. The pool we really liked and we had a good balance between interior peace and quiet and the coast. All positive really. Thank you. What did we enjoy most about our holiday in Sicily? The weather and the view and pool from Le Chicas. Le Chicas was one of our best villa experiences, so all parties happy and would be happy to return. Le Chicas is a lovely villa. We had a great stay and particularly enjoyed the view from the property. Le Chicas was exactly as described, very nice. The views were stunning. The overall experience was wonderful! Everything was great at Le Chicas! Our holiday was even better than we expected. We will be back! Overall, the villa was great. We loved the swimming pool and eating outside for breakfast and dinner. It was a lovely villa in an outstanding setting. The pool was fabulous. Your villas are possibly the best that I've seen anywhere and we all agreed that it was probably the best villa holiday that we've had. Overall a very good stay; owner very friendly and flexible. Le Chicas is a very nice villa with all amenities available. We have no real recommendations for improvements on your service - everything was really well arranged from start to finish and we would definitely use Think Sicily's services again in the future for next trip to Sicily. The house location was perfect - tucked up on a hill surrounded by fields but close to the beach on the nature reserve. The house itself was brilliantly set up and laid out with everything one might need on holiday. The outside dining area, living area and pool meant we essentially lived outdoors. All eight of us loved our holiday! We were extremely pleased with the property and thought that the photos on the website provided a very accurate description of the villa... We enjoyed the tranquil setting of the villa and the nearby beaches... I cannot highly commend Alex or Claudia enough in their efforts to make sure that we chose the correct villa and that everything was ready for our visit to Sicily. They were both always exceptionally helpful and easy to contact. Slightly basic but suitable for family with children who love pool. Owner and caretaker very welcoming and helpful. Chef wonderful... just like a Mamma should be. We thoroughly enjoyed the panoramic view of the apartment, the wonderful weather, the local beach, the temples and the local cuisine. The quality of the furnishings is top class and the location and views are very hard to beat... It was a great holiday and I would certainly go back to Sicily. Great views and beautiful location... Comfortable villa.